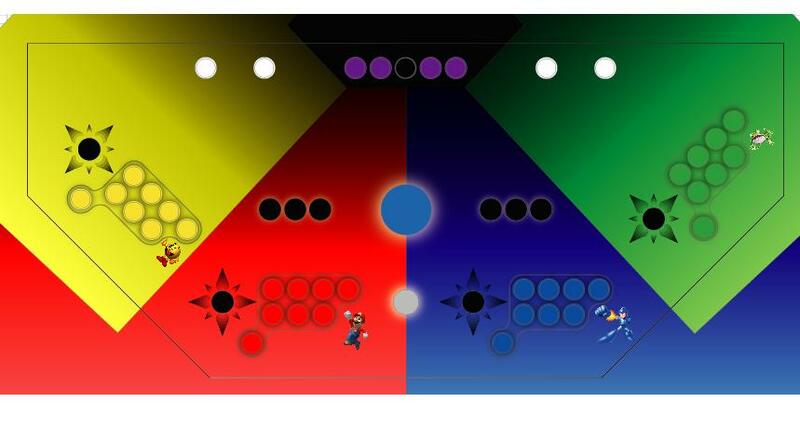 Just thought I'd toss out my CP layout and yes I do know that there aren't any 6+ button games for players 3 and 4. I'm future proofing (and the like the uniformity of all the players looking the same.) Anyway let me know what you think. The only thing I'm trying to figure out is whether to go with 7 or 8 buttons. Also I have to send out a thanks to JQ for supplying the character pics! Anyway let me know what you think. 1 thing bothering me though..that 4th button on the top row..thats for what?Neo geo?. Other then that,GOOD JOB ! And you should go with the second art,you know...play mortal kombat. Thanks Snaaake and yea it did take more than 5 minutes. I'm leaning towards the 8 button... I also have another 7 button that has the MK layout. The 8th button really serves 2 purposes. Yeah playing neo geo games would be little better..and there might be some console game that uses 8 buttons all the way.who knows what capcom is cooking now a days(ya never know )? Now with cup beer holders! Bring on the power tools! Looks really nice. I think it'll work out fine. Reminds me of Gauntlet. I'm feeling warm and fuzzy! Uh oh, better get the blue ointment out again. 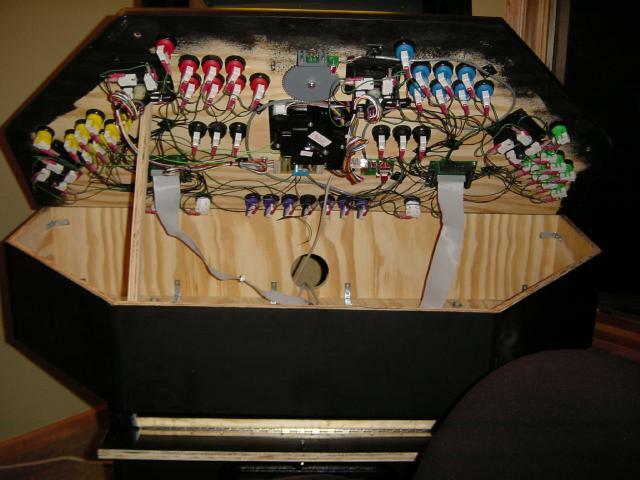 If you build a frankenpanel, chances are I don't care for you as a person. I like the second one better, and if you do that you may not need the 4th button on the top row. You could use the bottom row of 3 plus that "run" button for neogeo games. I'm guessing your planning on n64 emulation (super smash brothers!) or something in addition to mame. 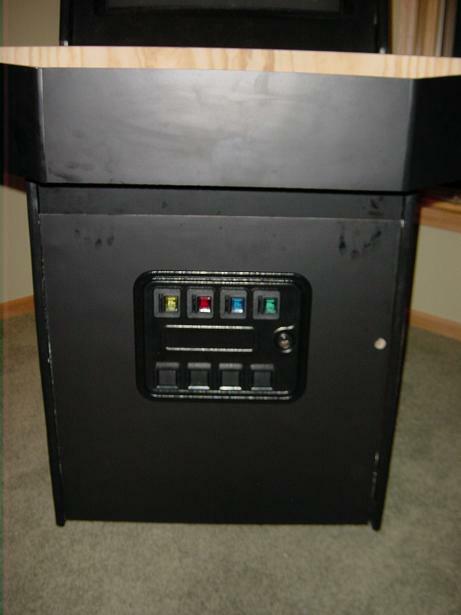 If you're only running Mame though, it only needs a max of 4 buttons for players 3 and 4 plus additional start buttons for the Dungeons and Dragons games. That will save you some space on the cp. You may want to scrap the labeling of players 1, 2, 3, and 4. 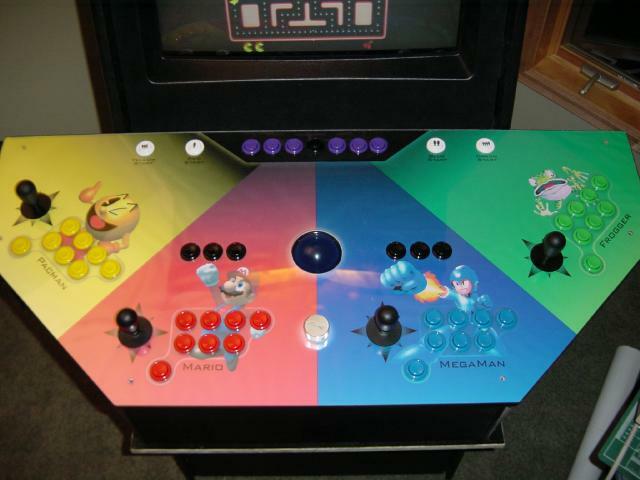 Some games like TMNT have it so Player 1 is always the furthest left, though I guess you chould change that by remapping the coin buttons within mame for that individual game. The Simpsons is like that as well (another konami game). I like the color separation, but I have an additional idea/suggestion. Perhaps in photoshop you could enlarge each players graphic (mario) and make it transparent, and saturated with that players color. 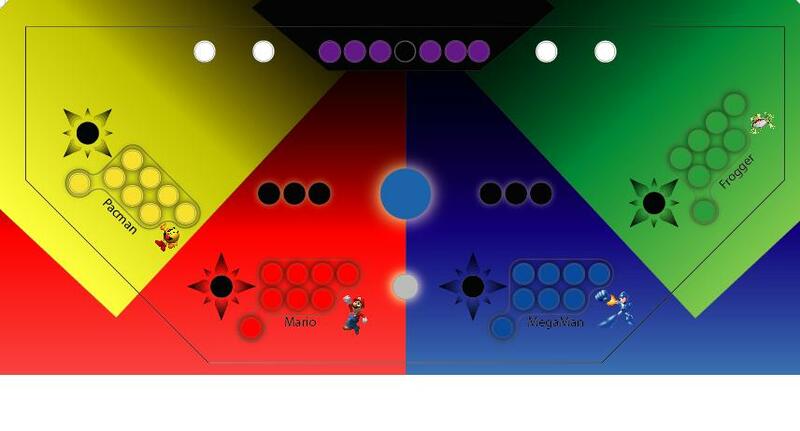 So for player1 there would be a large reddish transparent mario filling that section of the cp. Just throwing that idea in for you. 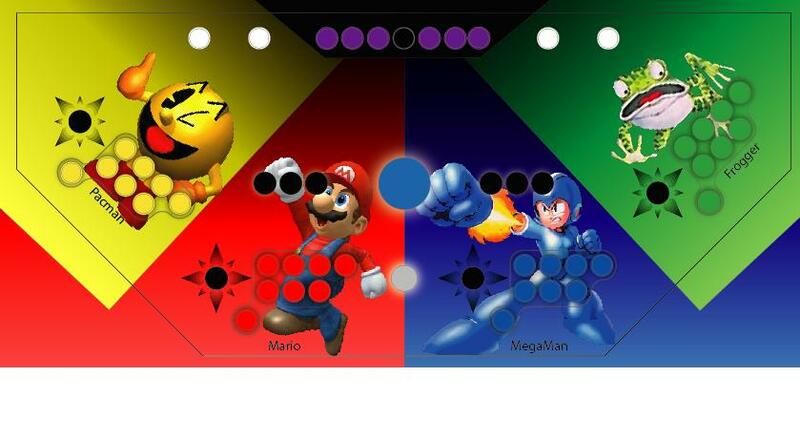 Its for future console games..
Like you know,if you wanna play 3 players sfa3 then you CAN ! . Like how we used to play..me alone against my 2 brothers(dreamcast version of course). Its really fun !I won most of the time even though I am fighting 2 people at once(yes I know I rule when it comes to any street fighter ). As far as the large transparent images... I tried it out and it looks pretty good, but I just don't have high enough res pictures to pull it off. I have to scale the images about 500% and they are just to grainy when scaled that far. I'll post them later when I get a chance so you can see what they look like. I have a hack on my site for mame that will "sense" pnumber of players and you can remap accordingly. Hadn't even thought of that.... makes me wonder what else I haven't thought of. Thanks SirPoonga those will definately make things easier. ...but what is the graphic next to player 4? player 4 = drunk purple fish? When the Germans bombed the British, the British ducked. When the British bombed the Germans, the Germans ducked. When the Americans started bombing, everyone ducked! Where do you work in a nuclear power plant? hehe That brain needs some rest! Have you been smokin weed again? LOL ! Frogger's chest look white and his mouth(inside) looks VERY little purple. Again,I know you are working hard. Thorn posted something about his cabinet and I thought it was Howard casto because same avater and I was bashing him around with "this isnt even your cabinet Howard". Because I worked like over 16 hours that day. Anyway anyone know how you setup dimensions in Adobe. Apparently (and after you think about it it makes sence) pixels and dpi are different. So I'm creating my CP overlay and using 150 pixels per inch for my drawing. When I go to print it's about 4 times larger than than I think it is. (really dont need a 16' CP ) Anyone know how to set up printing so 150 pixels = 1 inch? not sure about illustrator, i don't really use it, but couldn't you import the image into photoshop and change the dimensions? I just updated the pics up top to reflect some of the suggestions. What do folks think of the Mario/MegaMan/Pacman/Frogger text? Also how does it look if I go with 7 menu buttons instead of 5? Less is better, but I don't want to get into a situation where I need more than I thought I did. Anyway I'm headed to the printer probably tomorrow or Wednesday so if anyone has any other suggestions bring'em on! P.S. As promised here's Dr. J's request... it looks cool, but I just don't have hi enough res photos of the chars to pull it off. Looks nice this size though... enjoy. And I couldn't resist showing off my 4 player coin door... color coded to match! Its pretty good looking so far. 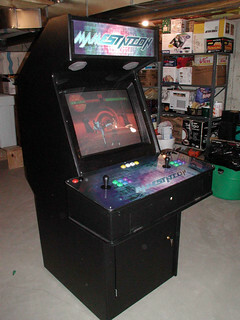 the top part looks very similer to mamestation 2 cabinet. Do I see a d9200 monitor up there ? 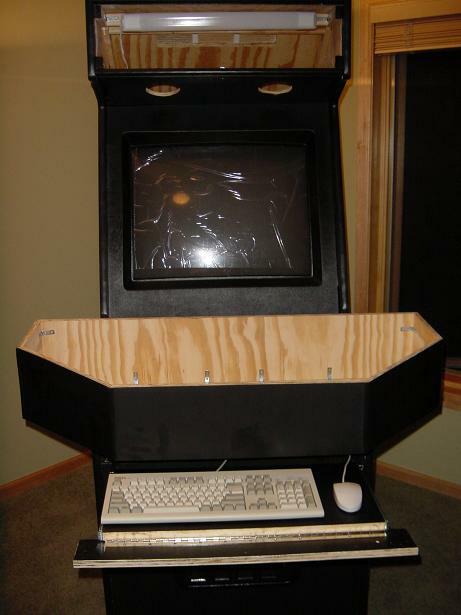 Hope you don't mind rolling your own mame. How much was your print though..I am guessing atleast over $50 right? The CP turned out a lot nicer than I thought! Nice job. Wow, the CP and the marquee are very sweet indeed, I like them a lot! Just updated my Marquee drawing above. Let me know what you all think. Right track, keep goin! Bolder Yet! Thicker, wider. How about a font with a white border around it? This place has tons of fonts..might wanna try . More updates to my marquee....what do you think? This one is better then the other one if you ask me..the font made a difference. You could just you know..make the glowing effect around the edges of the writing "Game on...". You know...since all the marques are like that..other then that..everything looks nice. The size of the font and the characters slightly in front have made a world of difference. yup, the latest one is definitely the best! Extreme envy on my part. And what a clean wiring job! Thanks folks... and yea Brax I have to give you credit, thanks for the input. Page created in 0.246 seconds with 60 queries.